First Appearance: Megaton Man (vol. 1) #3 (Apr. 1985): "I Am Called Bad Guy, Mortal!" 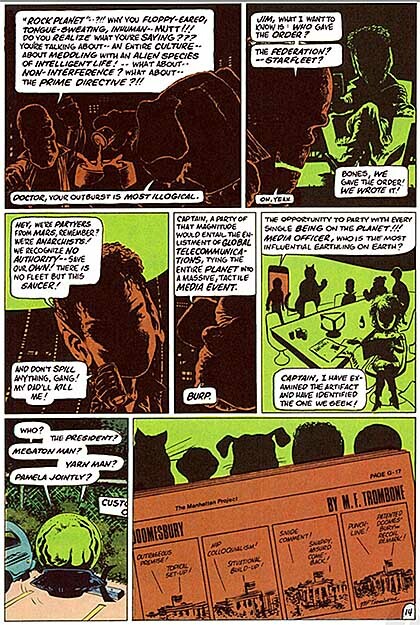 First Appearance (Additional Details): (1-panel Next Issue preview cameo) Megaton Man (vol. 1) #2 (Feb. 1985): "Leavings and Beginnings! "; (full) Megaton Man (vol. 1) #3 (Apr. 1985): "I Am Called Bad Guy, Mortal!" 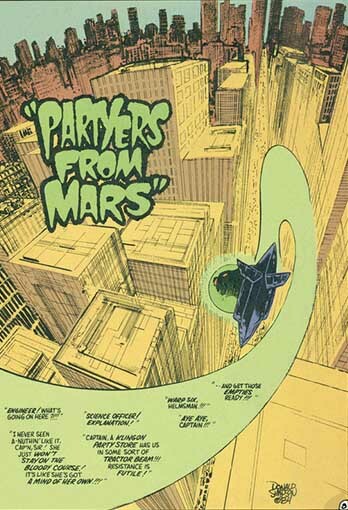 The Partyers from Mars are aliens who fly around in a flying saucer named George has a Gun. 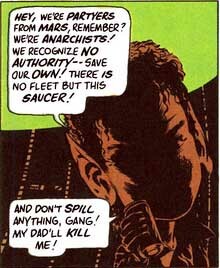 Jim, the Captain of the Partyers from Mars, explicitly identifies his group as "anarchists." 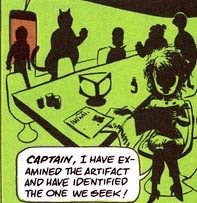 In panel 3 on page 14 in Megaton Man, Jim states: "Hey, we're Partyers from Mars, remember? We're anarchists! We recognize no authority -- save our own! There is no fleet but this saucer! And don't spill anything, gang! My dad'll kill me!" Megaton Man (1990): "I Am Called Bad Guy, Mortal!" Megaton Man (vol. 1) #3 (Apr. 1985): "I Am Called Bad Guy, Mortal!" Megaton Man (vol. 1) #5 (Aug. 1985): "Stella's Story"
Megaton Man (vol. 1) #7 (Dec. 1985): "No Badguy Shall Escape My Patrol!" Megaton Man (vol. 1) #9 (Apr. 1986): "It's Another Me! But Is He Friend, or Is He Foe?!!" Megaton Man (vol. 1) #10 (June 1986): "Overkill!"